Since all organic-based devices are made by deposition of successive layers (metal, oxide, insulating or semiconducting layers), many key electronic processes (such as charge injection from metallic electrodes, charge recombination into light or light conversion into charges, spin injection, etc.) occur at interfaces. 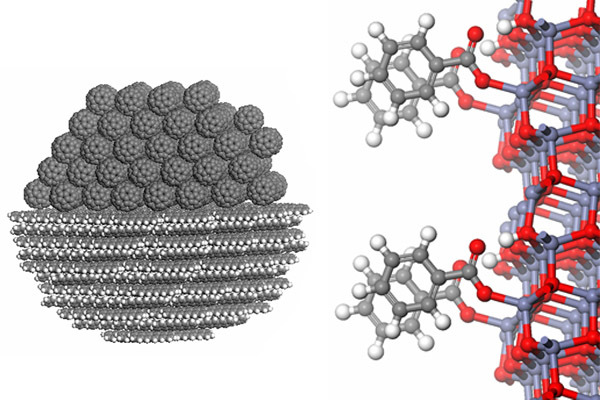 We develop and apply modeling tools based on molecular mechanics, quantum chemistry and solid-state physics to assess the geometric and electronic structures of organic/organic, metal/organic and inorganic/organic interfaces. On the one hand, we aim at obtaining a detailed cartography of the electronic structure at the interface and how it relates to the chemical nature of the materials in presence. Predicting the nature of the lowest electronic excitations at polymeric semiconductor heterojunctions. ElectronicProcesses at Organic/Organic Interfaces: Insight from Modelling andImplications for Opto-Electronic Devices. Beljonne, J. Cornil, L. Muccioli,C. Zannoni, J.L. Brédas, F. Castet. Chemistry of Materials 23 (2011)591-609. The Role of DrivingEnergy and Delocalized States for Charge Separation in Organic Semiconductors. A.A. Bakulin, A. Rao, V.G. Pavelyev, P.H.M. van Loosdrecht,M.S. Pshenichnikov, D. Niedzalek, J. Cornil, D. Beljonne, R.H. Friend. Structural andElectronic Properties of the TTF/ZnO(10-10) Interface: Insights from Modelling. S.Nénon, R. Méreau, S. Salman, F. Castet, T. Van Regemorter, S. Clima, D.Beljonne, J. Cornil. Journal of Physical ChemistryLetters 3 (2012) 58-63. Tuning the Interfacial Electronic Structure at OrganicHeterojunctions by Chemical Design. Mothy, M. Guillaume, J. Idé, F. Castet, L. Ducasse, J. Cornil, D.Beljonne. Journal ofPhysical Chemistry Letters 3 (2012) 2374-2378. Energetics ofElectron-Hole Separation at P3HT/PCBM Heterojunctions. D’Avino, S. Mothy, L. Muccioli, C. Zannoni, L.Wang, J. Cornil, D. Beljonne, F. Castet. Journal ofPhysical Chemistry C 117 (2013) 12981-12990.